Hello beautiful people, I still can’t believe I am actually writing this, but here it is, this is how everything went down. I had prepared my birth preference list, that said: natural labor, intermitment monitoring, free movement, water birth. However, my whole experience went totally opposite from that. First, I was overdue 9 days and induction was to be my only option, then the contractions begin, the day before I was scheduled to check into the hospital. During my contractions I was trying to breathe and relax as much as possible, but the contractions hit my back, and as they progressed they hit my hips and legs as well, making me very stiff and unable to move freely. This back pain I did not expect at all. I think that was one of the reasons I took Paracetamol and later on I screamed for more drugs, so they gave me Pethidine, which really took the edge off the contractions. My first contractions started at 3am Wednesday and by 3pm Thursday I was open 3 cm and ready for my Delivery Suite. When I got there I had everything I wanted, including birthing pool, but I just couldn’t cope with the pain in my back and hips, so I said yes to the epidural as well. Before I got it, I was on gas as well, but I felt gas have had a boomerang effect, first it would take the edge of the contraction, but then it would hit me even harder. Something like being drunk and trying to fall asleep while you’re having vertigo and urge to throw up. Getting epidural wasn’t easy with such strong contractions, because I wasn’t suppose to move, but in so much pain, I just wanted to have some relief, so I sucked it up. After that I was in paradise, one of my legs went totally numb, so my husband had to lift it up every time I needed to move. That was fun. Other than that I loved epidural, it became my best friend. Since I wasn’t progressing they gave me drip as well, but baby didn’t like that so his heartbeat slowed down, and they had to turn it off and than back on couple of times. They even tickled his head, to wake him up, while he was still inside of me. Again, I didn’t feel anything, so they could do whatever they wanted. 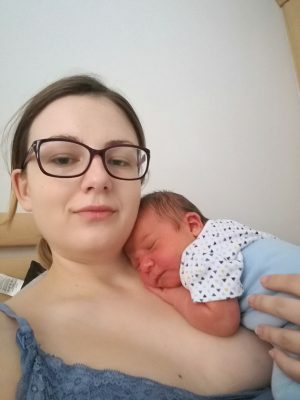 Around 9pm they started preparing for emergency C section, because I was still on 3 cm, and I was OK with that too, partly because of drugs, partly because I wanted to be over with and meet my baby. During the last check before taking me to the theatre, just a little bit after 10pm, I was 10 cm open, and they couldn’t believe it and neither could I. Maybe baby got scared, hearing the word C-section. After that everything went down fast, I started pushing at 11 pm, and after 4 push and half and hour later the baby Gabriel was out, screaming on my chest. They said I pushed great for the first time mother and someone who didn’t feel contractions, rather pushed when being told. I tore up a bit and had to be sewed up, but didn’t feel a thing again. I had no control over my labor, but that was OK, because I was prepared and had an open mind, so instead of having traumatic I ended up with positive experience and happy ending.